Justine Frischmann, "Lambent #90," 2016, oil, acrylic spray enamel over sublimation print on aluminum, 59 1/2 x 54"
We live in a hybrid age with the old hierarchies and lines of demarcation dissolving, usually for the better. In art, the pleasures of recombination usually outweigh the outrage of purists. 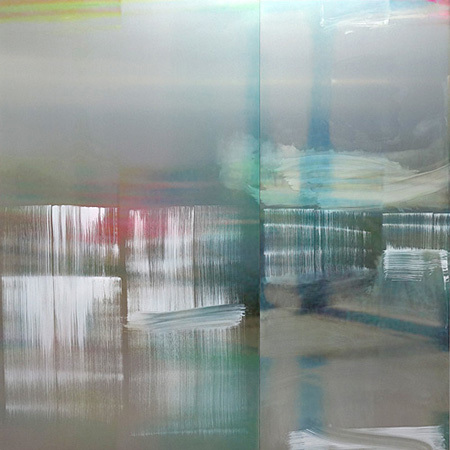 In the case of Justine Frischmann’s mixed-media paintings, oil paint brushed and sprayed atop subtly printed digital photographs infused on aluminum, we have a mash-up of painting and photography, as well as abstraction and realism. This would have raised aesthetic hackles a generation ago, but now seem an inevitable and fruitful blurring of what now strike us as arbitrary boundaries. The British-born punk rocker of Elastica, now living in San Francisco’s North Bay, and student of architecture and Buddhism, proves that crossover talent is no oxymoron with her “Lambent" series of paintings. These softly shining, glowing or flickering abstractions alternate between the virtual space of their photographic source material and the charged space produced by her painterly interventions in spray enamel and brushy gestural white oil paint.